Pre heat your oven to 160C. 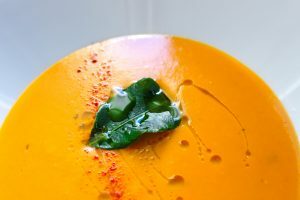 Place the pumpkin on a baking tray and pour over some of the coconut oil, reserving roughly a tablespoon for later on. Try to evenly coat the pumpkin with the oil. Season with salt and pepper, then place in the oven for about 30-40 minutes. The pumpkin should bake and soften, without browning as supposed to roasting which will caramelise the pumpkin and give the soup an undesirable brown colour later on. The process of baking the pumpkin like this will intensify the flavour of the soup. Once the pumpkin is cooked, take it out of the oven and set it aside. Meanwhile, in a large pan add the remaining coconut oil, onion, celery, garlic and ginger and sweat the vegetables on a low heat with a good pinch of salt. Once the vegetables have softened, add the Thai curry paste, cooking the paste out for a few seconds. Now add the cooked pumpkin, potato, keffir lime leaves, coconut milk, and chicken stock along with 400ml of water (you can use the empty coconut milk tin to measure out the water). Turn the heat up to a medium/high heat, bringing the soup to a boil and then lower the temperature to allow the soup to simmer for about 20 minutes. Test the potato pieces and if they are cooked, you can remove the soup from the stove. Take out the keffir lime leaves and using a stick blender blitz the soup until velvety smooth. Check the seasoning here, adding more salt and pepper if needed. If the soup is too thick, add some boiling water, a little at a time to loosen it but be sure to check the seasoning again if you do this. If the soup is too thin, you can return it to the hob and reduce it down on a gentle heat. Serve with a keffir lime leaf and some cayenne pepper as a garnish if you like of some coconut cream.